A bride has planned a storybook wedding in Las Vegas. Unfortunately, her groom is late and isn’t answering his phone. Should she cancel the wedding, disappoint her guests, and devastate her mother? Not when the groom’s twin brother agrees to stand in as the bridegroom. 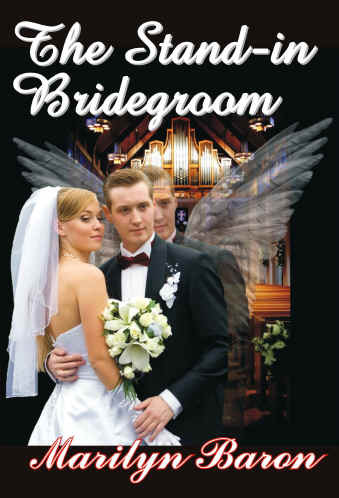 A Review by AJ Kirby, Leeds, UK "Perfect World"
The Stand-in Bridegroom forms the third part of Marilyn Baron’s angel trilogy of short stories. Having been wowed by ‘Follow an Angel’ and ‘A Choir of Angels’ in the past, I knew to expect something great from this excellent author third time out. And this story didn’t let me down. Like Baron’s other work, it delivers a great premise, excellent dialogue, memorable characters, and enough emotion to fill the audience at a real wedding. But this author’s real skill is in keeping the audience hooked, and in developing plausible twists and turns which astound. Consider this set-up. The scene is the Bellagio Hotel, Las Vegas, and: “The wedding celebration of Patra Grace Collins and Douglas Luke Grainger was about to get under way. The groomsmen escorted the parents and grandparents to the white silk-draped pews up front. Flower girls scattered fresh white rose petals on the walkway. Then her attendants began their slow stroll down the aisle to Pachelbel's Canon in D Major.” Could hardly get more romantic, could it? Well, there’s a problem. The groom, Doug, isn’t there, and, in his place is his identical twin brother Dex. This story is full of the usual Marilyn Baron wit. It’s also high on narrative tension. I won’t spoil the appearance of the angel, or the ending, but rest assured, this is a brilliant, well-rounded story which will tug on the heart-strings and jog that funny bone. Review by Dean Giles, London, author of "Alien Apocalypse - The Storm" and "Ghost in the Machine"
When Patra’s husband-to-be is delayed the day before their wedding, it soon becomes apparent he’s not going to make it in time for the ceremony. Patra makes a rash decision together with the groom’s twin brother: he must take his brother’s place at the altar. Marilyn Baron easily portrays Patra’s multilayered character; her fears and happiness come to the surface in this terrific short story. The ending is strong and emotionally fulfilling. I highly recommend this story along with Marilyn’s previous two standalone installments in the series: A Choir of Angels and Follow an Angel. And that is when things start to get really get exciting. Marilyn Baron has a wonderful voice and an imagination that works overtime. This is her third in her popular angel stories published by TWB Press. I highly recommend this to anyone that loves a good romance thrown in the middle of a little paranormal activity. My first introduction to Marilyn Baron’s work was when I read her short story, ‘A Choir of Angels,’ a really funny supernatural story of family love and a never-say-die attitude. I was hooked immediately on her entertaining narrative style and her latest release through TWB Press, 'The Stand-In Bridegroom,' once again demonstrates her strength for giving truly romantic fiction a subtle and unforgettable twist. Patra's wedding day is going to be the biggest day of her life. Not just hers, but the biggest day of her mother’s life too. Nothing can go wrong. But it does. Her husband-to-be, Doug, has vanished. Luckily for her, his twin brother, Dex, is conveniently there to fill his shoes. As Baron weaves the tale in her unique manner, it is very easy to lose oneself in the romance of the story, so believable are the main players, but all the while there is a distinct taste of something not quite right. Secrets are being kept and the truth is bubbling to the surface as this story starts to boil over. I'm not going to ruin the ending, but trust when I say that my mouth fell open when the finale played out. Baron has a wicked skill of leading you down not just one but several false paths before smacking you in the face with a 'killer' ending. 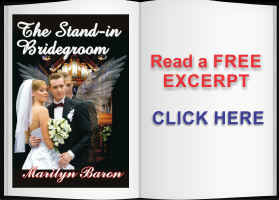 'The Stand-In Bridegroom' starts well and ends better... and once again Marilyn Baron simply does not let you down. Who would have thought that cross-over supernatural romance could be this good?